"I'm concerned about students and faculty feeling they always have to be connected. People need time away from their devices," noted a faculty member at a four-year public institution in Ohio. "I think that's getting harder to manage." "Many people are anti-mobile phone use in the classroom," admitted another faculty member at a four-year private nonprofit institution in Texas, who saw a silver lining to the technology: "The one advantage is that the student can only look at one screen at a time, which actually helps their focus. If you can integrate learning activities that use the phone, the students really seem to better absorb the content." And a faculty member at a four-year public institution in Michigan pointed out that students often don't see the learning potential of their devices: "My students only know how to use their smartphones to call/text/play games/monitor social media — they do not see their smartphones as micro-computers that can do so much more." 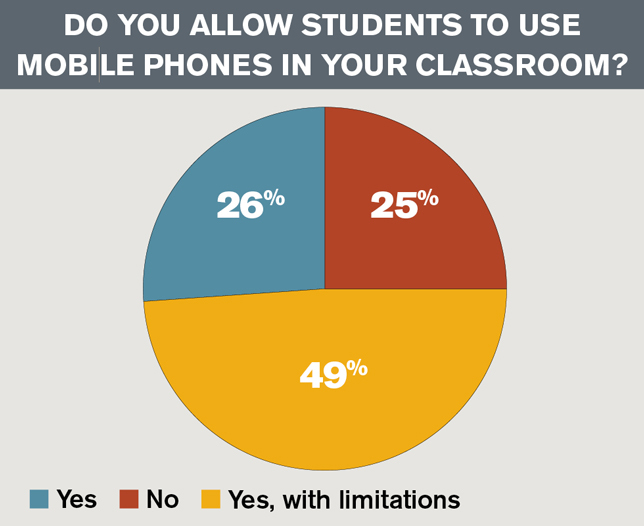 Learning tool or no, the mobile phone is one of students' top two favorite technologies to use in the classroom, according to our survey. Forty-nine percent of faculty respondents said laptops were the most popular device used by their students, with mobile phones coming in second at 38 percent. Smart watches were deemed the least favorite device used by students, garnering zero responses. Where are all these mobile devices coming from? Forty-one percent of respondents said their institutions require students to provide their own devices, and 21 percent said their institutions provide all or some students with devices. At 79 percent of institutions represented in our survey, no devices are provided (but they are not necessarily required). 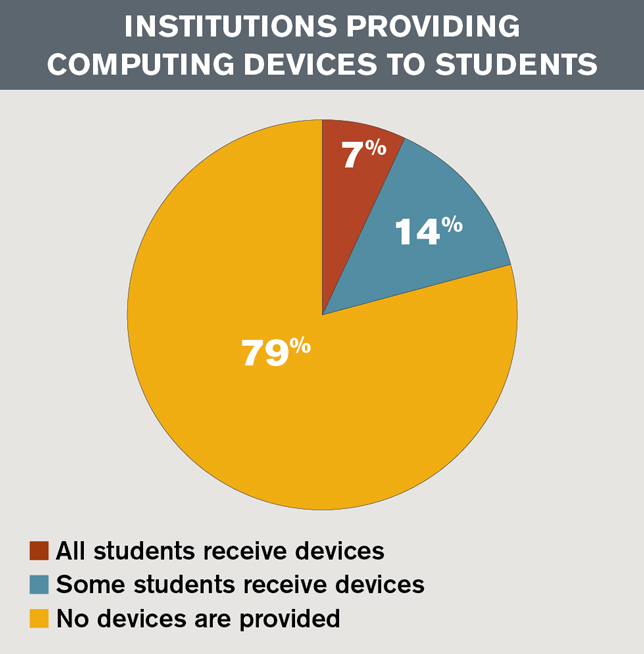 About half of faculty respondents (54 percent) believe their institutions should provide devices to all students, to some extent. 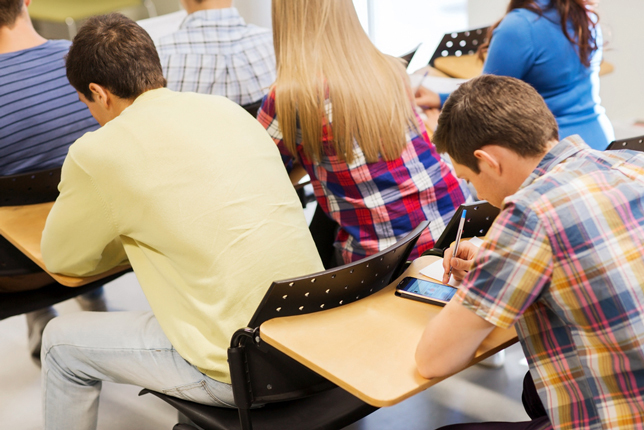 Slightly more (59 percent) think students should provide their own devices. 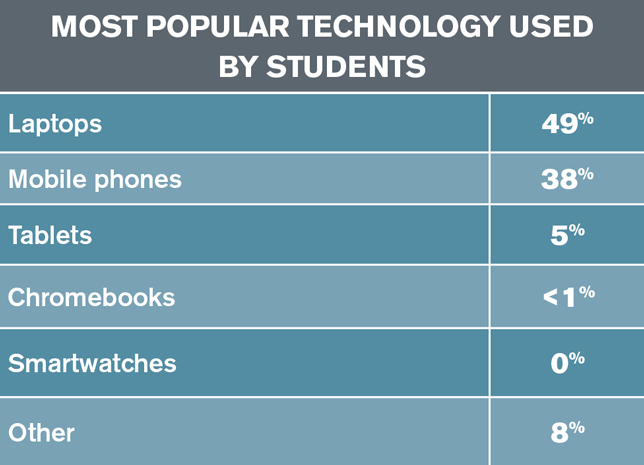 With all those devices in class, we wondered about students' technology use at home — specifically, their access to the internet. Just 17 percent of faculty respondents said they believe all of their students have internet access at home, while 60 percent believe at least three-quarters of their students have access. A significant number of respondents — 19 percent — admitted that they have no idea whether their students have home internet access. That's somewhat surprising, since 92 percent of respondents assign homework that requires the use of technology (and presumably the internet), but only 6 percent of respondents' institutions provide internet access at home for students in need. Therein lies the digital divide, as one faculty member at four-year private nonprofit institution in Iowa pointed out: "Broadband capability is still an issue in rural areas and impacts many students and families. There will never be 100 percent access for all students in their homes. It is simply not feasible logistically or financially."